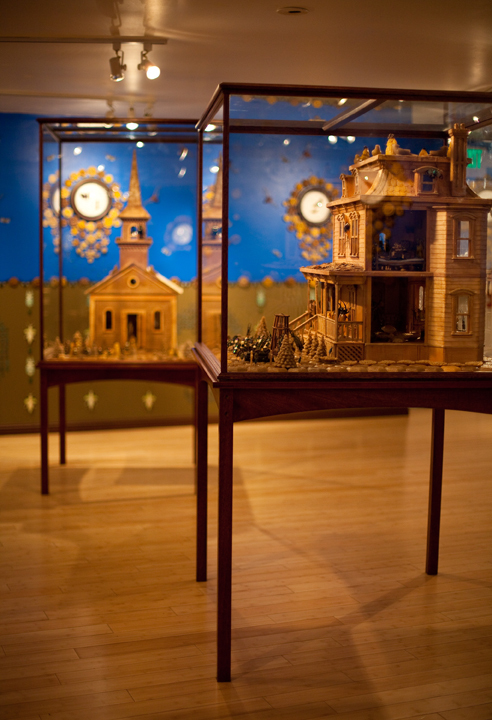 All Creatures Great and Small, installation view, Jennifer Angus, 2011. The Jennifer Angus show at the Craft and Folk Art Museum is a wonderful mix of entomology, environmental critique, design and hobby. Using an array of real exotic insects from around the world, she creates a combination of pattern, signage and doll house wonders. Transcending the common repulsion to bugs, Angus uses them in such a way that all of their beauty is on display. Shimmering metallic colors on bug bodies, filigree wings, and calligraphic pinchers, attest to the individual and natural beauty of each creature. The insects are in abundance in the many installations and their populations are beautiful and frightening in their immensity. 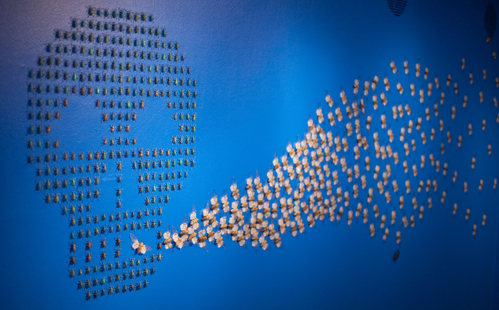 Directly upon entering the exhibit room, you are faced with a skull comprised of insects, with a cloud of more insects seemingly escaping from the mouth of the skull. The skull is a motif throughout the show and it brings to mind the skull and cross bones of the warning on a bug poison bottle along with a reminder of the ever ongoing life cycle of insects, where life and death is a minute by minute experience. 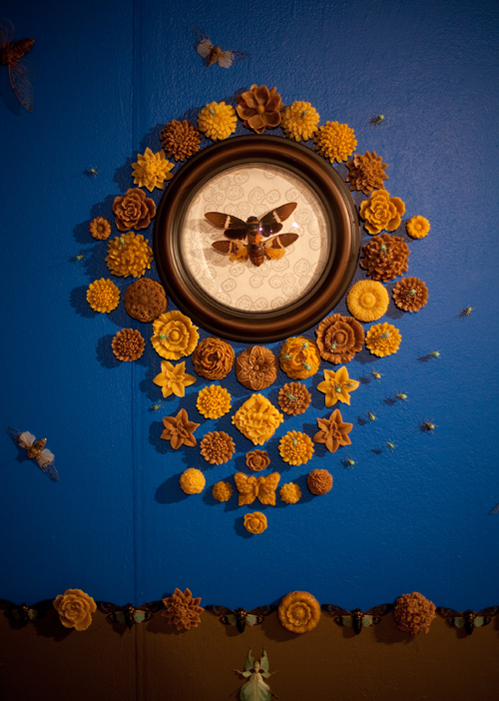 The walls are "decorated" with Victorian era framed bugs, pins piercing the bug bodies are evident throughout, a referral to our fascination with these pre-historic creatures and desire to collect them as objects. Angus uses beeswax to create molded shapes of flowers, tiles and soaps, this represents the myriad of materials that are a natural part of an insects home whether it be a hive or a mud nest. Patterns and designs are replicated across the walls alluding to not only human design but the fact that individual insects of a species, are of the same design, seemingly popped from a mold in thousands of replications. 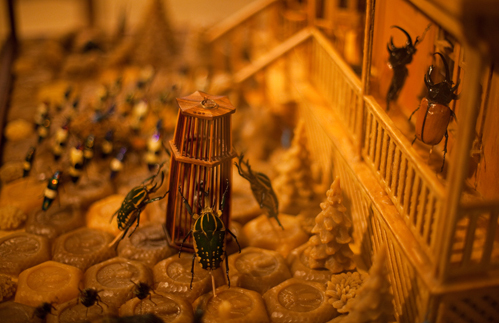 And finally, there are doll houses in vitrines, that are populated with insects. Many are shown in typical human settings attending to typical daily actions. This is appropriate since we know that insects tend to build nests and webs, their version of home. Yet it's ironic because humans do everything they can to rid their homes of bugs and it's perverse to see them living a normal life in a human setting. In other places, it is quite surreal, as in one setting where beetles are gathered around a clock and seem to be worshipping at an altar. Coincidence that we humans are the clock watchers while insects follow an internal clock and rhythm to all of their cycles? I think not. Throughout the miniature homes, you see bugs in scenarios that mirror our own with a twist of oddity that begs for some reflection on our part. The show runs through September 11 at CAFAM.